Scott has been documenting JavaFX since its inception in 2007. Prior to that, he has contributed extensively to both the Java Tutorial and Java platform documentation. JavaFX makes it easy to create modern-looking graphical user interfaces (GUIs) with sophisticated visual effects. This tutorial explores the JavaFX Scene Graph Application Programming Interface (API), the underlying framework that renders your GUI to the screen. The individual items held within the JavaFX scene graph are known as nodes. Each node is classified as either a branch node (meaning that it can have children), or a leaf node (meaning that it cannot have children). The first node in the tree is always called the root node, and it never has a parent. See a general inheritance diagram in Figure 1. Description of "Figure 1 Root, Branch, and Leaf Nodes"
The JavaFX API defines a number of classes that can act as root, branch or leaf nodes. When substituted with actual class names, this same figure might resemble that shown in Figure 2 in a real application. Description of "Figure 2 Specific Root, Branch, and Leaf Classes"
In Figure 2, a Group object acts as the root node. The Circle and Rectangle objects are leaf nodes, because they do not (and cannot) have children. The Region object (which defines an area of the screen with children than can be styled using CSS) is a branch node that contains two more leaf nodes (Text and ImageView). Scene graphs can become much larger than this, but the basic organization — that is, the way in which parent nodes contain child nodes — is a pattern that repeats in all applications. So what does this all mean in terms of code? 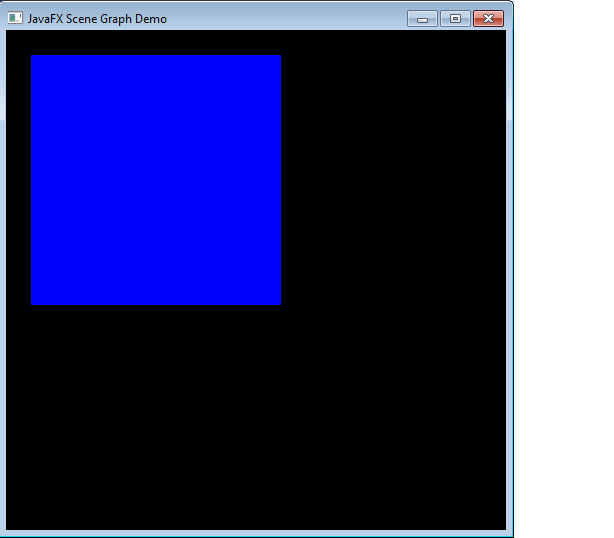 Let us start by setting up a basic application frame, populated with only the root node, as shown in Example 1. This code produces a window that looks like what is shown in Figure 3. 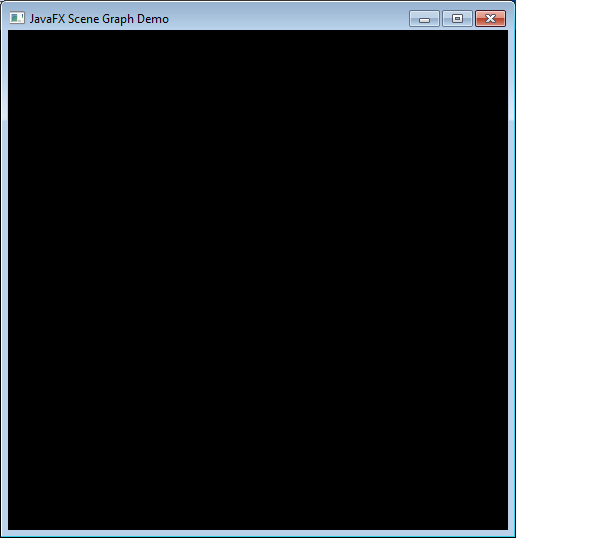 Description of "Figure 3 Creating a Scene with Root Node Only"
The resulting application appears as it does because black is the scene's fill color. Because the root node currently has no children, there is nothing else to display. Adding a child to the root node can be accomplished with the modifications shown in Example 2. With the change shown in Example 2, a blue rectangle (leaf node) that is 250x250 pixels will appear at the specified X and Y coordinates. (By default, X increases from left to right, and Y increases from top to bottom. This can be affected by transformations, however.) Figure 4 shows the result of adding a leaf node. Description of "Figure 4 Adding a Leaf Node"